Mobile App Solution | Hospitality Solutions - Converge Solutions Inc. Mobile App Solution | Hospitality Solutions - Converge Solutions Inc.
Everything your guests need. In one place. 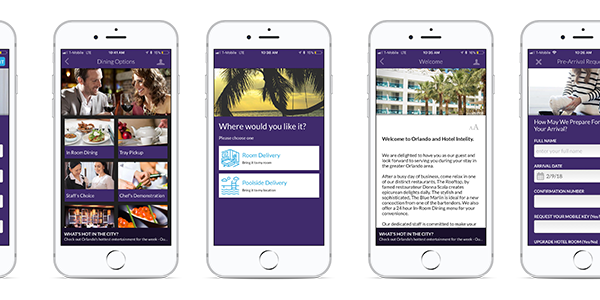 Gift your guests a hassle free traveling experience via a mobile app with easy access to pre-arrival requests, in room dining, accommodation information, and concierge services at their fingertips. The rate of mobile device adoption has been faster than any other consumer technology in history, including PCs, the Internet, and social media. As a result, this technology is quickly becoming a significant factor in every aspect of our lives. Provide your guests with greater control by turning their mobile devices into guest service tools, while they are located on your property or anywhere else in the world. Orders and requests can be placed even before they arrive at your property. Give your guests the options of checking in early, making advance dinner reservations or even requesting additional bedding. Alleviate the demand on your staff with Mobile Key software, allowing guests to bypass reception entirely. Allow for a convenient dining experience via mobile app with options of requesting room service, finding information on local dining options, or making reservations. Guests will have access to airline information, ability to request a car, valet or rental via their mobile device. Guests will have the option of selecting convenient housekeeping times or requesting turn down services via mobile device.